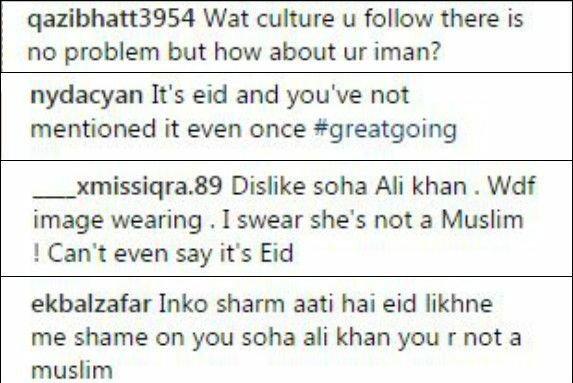 Soha Ali Khan posted a picture on Instagram on Tuesday for which she got hateful comments for wearing a sari. Soha Ali Khan, who is expecting her first baby with actor husband Kunal Kemmu, was subjected to a few hateful comments for sharing a picture of herself in a sari on Instagram. The 38-year-old actor posted the photo on Tuesday from what many are guessing is a traditional Bengali baby shower. Soha wore a pink silk sari with flowers in her hair and posed with Kunal who wore a white kurta pyjama. While most comments congratulated her on her pregnancy and praised her look, many even criticised her for her choice of outfit and not wishing her fans on Eid. A lot of her fans even came to her support saying that she has the right to wear whatever she chooses. Soha is the daughter of former cricketer Mansoor Ali Khan Pataudi and actor Sharmila Tagore. Soha and Kunal Kemmu married in January 2015. Recently, Dangal star Fatima Sana Sheikh was also criticised on social media for posting a picture in beachwear during the month of Ramzan.